Purchasing this item will earn you at least 450 GES RewardPoints! The power cord of a luminaire is often considered as an unavoidable must of the construction, which has to be hidden as best as possible – rarely with great success. The French designer duo Ronan and Erwan Bouroullec go a different way. They ingeniously reverse that thought about cords, making this essential part of the luminaire an aesthetic element. 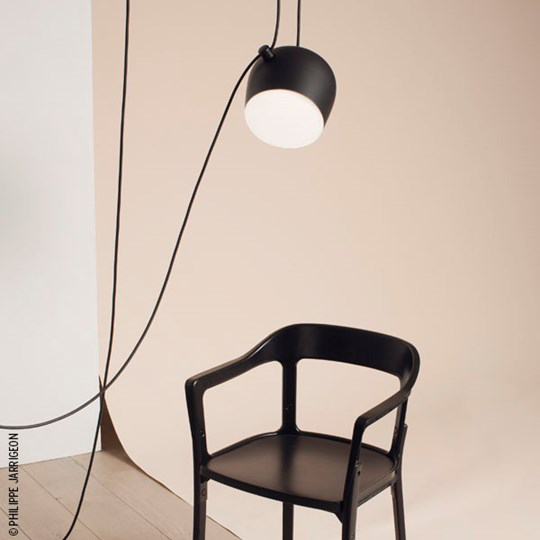 The Aim pendant light integrates the power cord as an important component of the design, with the additional function to make the height of the lampshade flexibly adjustable. Furthermore the pendant light has got a plug and can be mounted independently from a fixed ceiling connector. Wherever there is a socket in the room, Aim can directly be used. The decision where to mount your luminaire is totally up to you now, you have absolute freedom, which gives you the possibility to realize individual and innovative furnishing ideas. Due to this brilliant design Aim's spun and liquid coated aluminium shade can be adjusted to any direction, which allows you to make optimum use of the light. An integrated dimmer makes it also possible to steplessly vary the intensity of the light. The Aim pendant light is equipped with an economical and energy-efficient LED illuminant, which is not only eco-friendly, but also provides a long lifespan for your lamp. The manufacturer Flos offers this revolutionary pendant light in three different colour options.